No filmmaker's career has been more defined and structured by their musical choices than that of Werner Herzog. This claim is evident from his first full-length feature, Signs of Life / Lebenszeichen (1968), which he made when he was 24 – three years after having written the screenplay. (He claims he got the idea for it when he was 15 or 16, apparently from a story by German author Ludwig Achim von Arnim [1781-1831].) Though made by a newcomer, Signs of Life is an extraordinary film – not because it is technically brilliant, but because it offers such a mature artistic touch. A good counterpoint to Signs of Life would be Martin Scorsese's film debut, Who's That Knocking at My Door? Even though it shows much talent, Scorsese's first effort is the art of a young man for in the film the protagonist suffers an angst pervasive among young men. By contrast, the hero of Herzog's film debut is suffering from something far deeper – the sort of psycho-spiritual ravages that beset one in a midlife crisis. Yet, it's not merely the protagonist's crisis that makes Signs of Life a mature work, but how said crisis is represented. Herzog's approach to his subject matter shows why he would become the most daring – if not the greatest – filmmaker of the last forty years. Signs of Life is spare in its dialogue, its visuals, and its music, but like a Beckett play gone straight this approach only heightens the attention needed to the smallest of details. That's where the emotive brilliance of the Greek string music, as evocative as the zither used in The Third Man, comes in, even as it counterpoints against the images the film unleashes. Signs of Life starts with a voiceover narration that runs through the whole film. A wounded Wehrmacht soldier and parachutist named Stroszek (Peter Brogle) – no connection to the lead character of Herzog's 1977 drama Stroszek – is wounded in a Nazi attack on Greece during the Second World War. Stroszek is recovering on the remote Aegean Island of Kos, where the horrors of war have yet to reach. Indeed, only sixty German soldiers are needed to keep the sedentary locals in line. Stroszek is given light duty guarding an ancient fortress and ammunition dump with two other soldiers: the thin intellectual Becker (Wolfgang von Ungern-Sternberg) and the older, heavy, and balding Meinhard (Wolfgang Reichmann). He is also given permission to marry one of the local Greek girls, Nora (Athina Zacharopoulou), who is trying to learn German. Together, the quartet's greatest battle is against boredom in the enervating dry, hot, and craggy landscape. Becker becomes obsessed with decoding ancient Greek tablets, while the dimmer Meinhard obsesses over the island's cockroaches, attempting to devise elaborate Rube Goldbergian traps for the insects. In the meantime, the married couple cavort and show affection in assorted ways, but Stroszek is clearly not all there. In modern terms, he would be described as suffering from some sort of post-traumatic stress disorder. Herzog balances the humans' dull routines by focusing on little “synchronicities,” such as fish that swim in circles or the patterns of humans in the small island town. This is a crucial aspect of the film, for most artists are incapable of depicting boredom without making boring art. Herzog shows that boredom can be captured in riveting ways. All of the islanders – both German and Greek – it turns out, are in one way or another, touched by Stroszek. When he goes mad – not long after an encounter with a pianist (longtime Herzog musical collaborator Florian Fricke) who tells him of Chopin's madness – Stroszek locks himself in the garrison, and threatens to explode it. The DVD, put out by New Yorker Video, comes with the original German theatrical trailer and a film commentary by Herzog moderated by Norman Hill (from Anchor Bay DVDs). The 86-minute film has white subtitles that occasionally wash out against the harsh, black-and-white landscape the film presents. The image is good, though there are occasional blemishes. Thomas Mauch's spare cinematography is terrific; it was clearly influenced by the films of Michelangelo Antonioni, especially L'Avventura, which was also filmed in the Mediterranean. The commentary by Herzog, one of the best DVD commenters around, also happens to be one of his very best. He not only expounds on the provenance of the film and its images, but on many of his artistic views. He mentions his childhood, his legendary pre-moviemaking past, and two of the short films he made prior to Signs of Life: Last Words and The Unprecedented Defense of the Fortress Deutschkreuz (a sort of a prequel to his first feature). Herzog also claims that Signs of Life was made on a mere US$20,000 budget after he'd won a German screenwriting award, and that he did it with a stolen 35mm film camera. Additionally, the filmmaker explains that he named the leading character Stroszek (in both Signs of Life and Stroszek) because that was the name of a classmate in college who did some assignments for him. 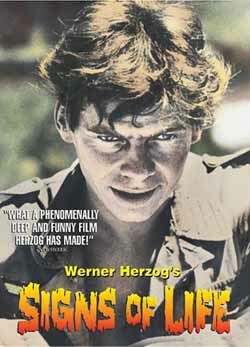 Signs of Life succeeds for multiple reasons, but chief among them is that, even at an early age, Herzog presents the German soldiers as men instead of rabid Nazi ideologues. All three of the film's male leads were likely conscripted against their will and seem to long for nothing more than the end of the war. Also, the black-and-white imagery captures a series of life-like moments, which later Herzog films would capitalize on, especially Even Dwarfs Started Small (1970). Overall, however, Signs of Life remains relevant because it blends music and imagery in ways few films ever have, thus backing up Herzog's later claim that he's never made an error in the musical selections for a film. Signs of Life is his first proof, but thankfully not his last. Here's hoping that that is one note whose resonance will continue to reverberate. Signs of Life / Lebenszeichen (1968). Dir. : Werner Herzog. Scr. : Werner Herzog; inspired by Achim von Arnim's story. Cast: Peter Brogle, Wolfgang Reichmann, Athina Zacharopoulou, Wolfgang von Ungern-Sternberg, Wolfgang Stumpf, Julio Pinheiro.